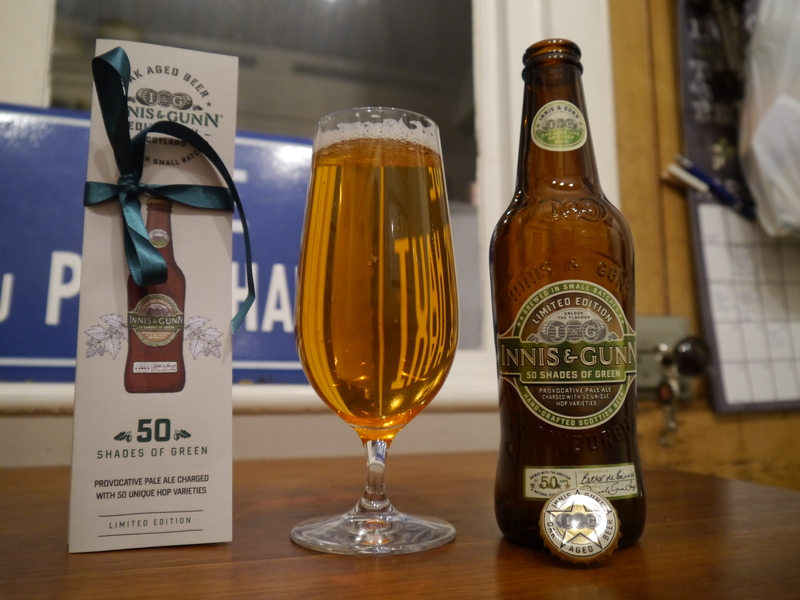 About a month or so ago, I managed to secure a bottle of the very limited run that Innis & Gunn produced to coincide with the release of the film 50 Shades Of Grey. 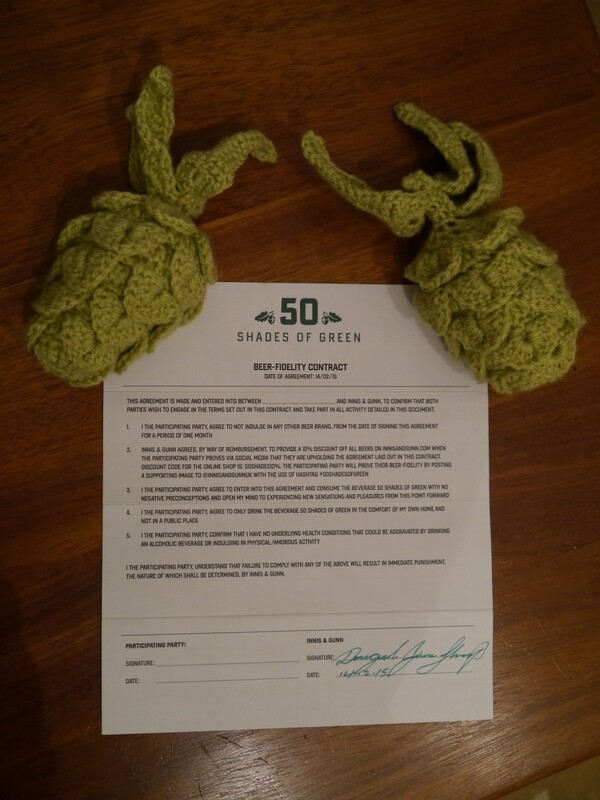 It was called 50 Shades Of Green and was billed to be a beer that was “infused with ginseng and other aphrodisiacs” and contained fifty different hop varieties. 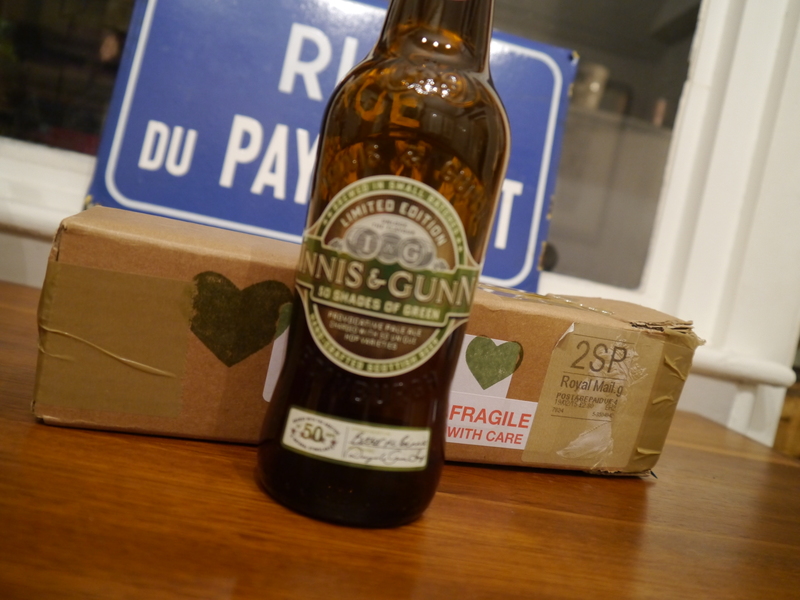 And when said bottle arrived, cocooned in a simple brown box, with a couple of green hearts stamped on to it, it kind of reminded me of the subtle, and supposedly nondescript packaging, that may contain some form of illicit goods that you need to hide from somebody. It’s a nice touch, but is it deliberate or did the money run out after committing to all those hops? 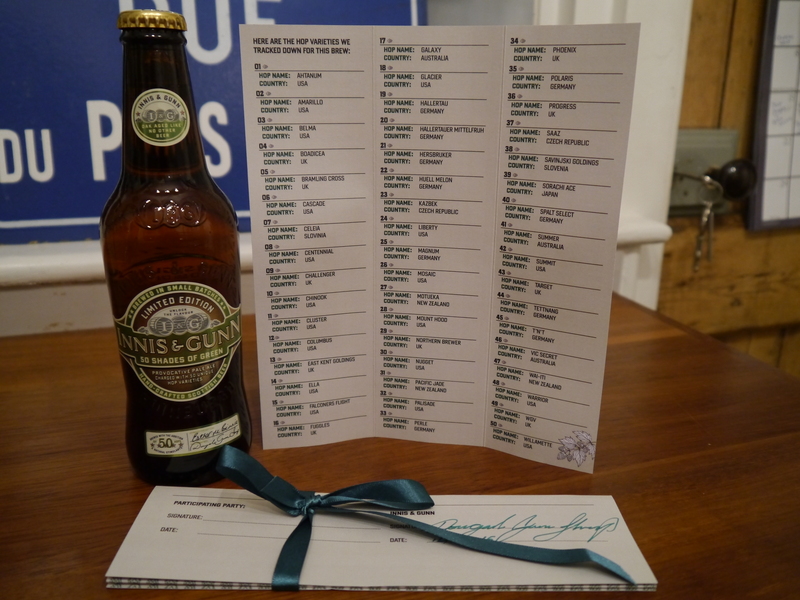 Contained within the cocoon, along with the bottle, is a list of all the hop varieties used to compile the beer and also a fidelity contract that states that you must not indulge in any other beer brand for one month! Well if I’m to be honest, I may have cheated and consumed some beer from another source. What will my punishment entail? So after all of this, is this beer worthy of all the hype? I dove in and opened my bottle expecting to be floored by an overwhelming global hop aroma, but instead I was greeted by a subtle biscuity malt smell. Hmmm. There’s a hint of pepperyness from all those hops, but it’s mainly malts with a mild grassy tinge coming through. Feels good on the tongue though, nice and full, but smooth too. There’s a light bitterness in there that’s coupled with a citrus taste and the finish is soft, but slightly uninspiring. I’m not quite sure what to make of this. It’s nice, don’t get me wrong, but I feel maybe too much is going on and some flavours are being cancelled out by others. It’s just not what I was expecting and certainly not the hoppy head rush I kind of wanted. This is a good pale, but if I’m honest, some smaller breweries out there are getting much, much more from the ingredients they have available to them. This is a shame as normally Innis & Gunn produce beers that are quite outstanding. The variety of flavours is very good and usually you’d only need to wave a Toasted Oak IPA or a Scotch Whiskey Porter in my face and you’d have my attention. But somehow 50 Shades is lacking, and it’s not for the want of trying. Cramming 50 hop varieties into one beer is no mean feat, but I feel the hype surrounding the original 50 Shades has got the better of them and the beer is just a sales tactic.